TL;DR: Dynamic Creative automates manual A/B testing so that you can deliver ideal creatives to the target audience that is most likely to act on your ad. Here, we will cover how the Dynamic Creative process works, how it improves ROI, what the best practices are, how to use it and how it has been successfully applied by one of our clients. Traditionally, A/B testing was a manual process where you had to discover which audience responded to which ad by creating fully formatted ads and then test each of them individually and manually. This process is time-consuming, heavy on manual labor and only allows you to effectively test one variable at a time (creative or target market). This time-consuming process has been replaced by a new technology which automatically evaluates every creative aspect of an ad and applies them to various audiences through machine learning. With Dynamic Creative, all you need to do is upload all of your creative assets (headlines, texts, descriptions, and images) and select one broad audience to be placed into a single “pot”. 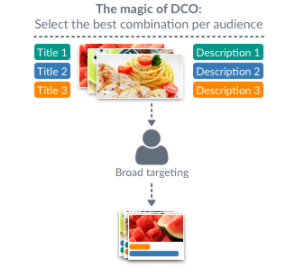 The DC technology automatically creates variants of ads and matches them with various audience subgroups. Up to 100 such variations may be created, thus out-counting the realistic possibilities of manual A/B testing. Facebook uses part of your budget to feed machine learning; which combination of creatives is efficient for which audience. The bigger the budget you set up the more you teach the algorithm but it can be slow so be patient and do not turn off or edit campaigns in the first 2 days. 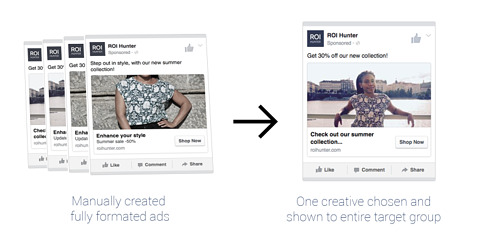 This way, ads are tested automatically, making it easy for the right ads to be served to the right people. As you can see in the graph below, DC will be able to determine the best performing combinations of the creatives and audience within 2-3 days, and optimize against your CPC, Website Conversions or Mobile App Installs (see the red-orange line). Since each combination will be matched to its audience, your ads will have bigger reach thanks to a better relevance score and CTR. You shouldn’t look for the best image and copy but only try to improve upon the worst assets to reach even more people. What would happen if you decided to use only the best of each asset? Your ad would reach only the part of the audience which is suitable for that combination and you could miss a huge part of your audience which would be reached by other combinations. It is also possible to use this function with the Carousel ad format. DC carousel uses your texts and images to create the best performing combination of cards. All cards will be directed to one destination URL. Facebook will display 10 cards in the live ads. ROI Hunter’s client Growww Digital is an agency that has been using ROI Hunter’s platform to help their own clients achieve better ROI on their ad spend. Bónusz Brigád, their client, had an objective to increase newsletter subscriptions. The agency used ROI Hunter’s platform and applied Dynamic Creative to ensure campaign success and return on investment. Run your first Dynamic Creative campaign, and try our platform today! 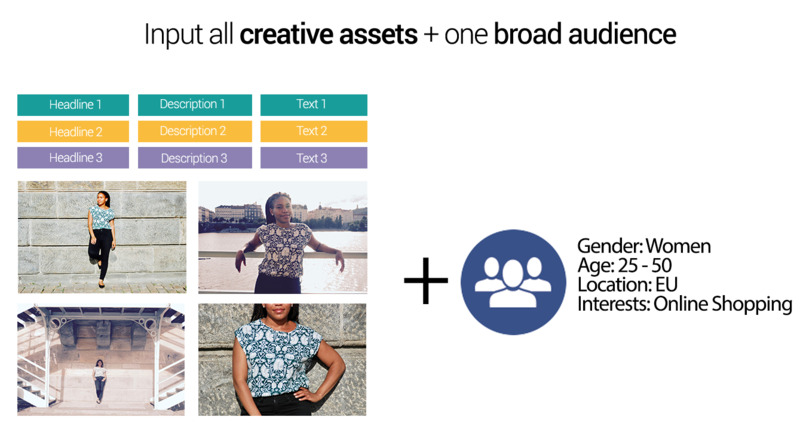 With Dynamic Creative, all you need to do is upload all of your creative assets (headlines, texts, descriptions, and images) and select one broad audience to be placed into a single “pot”.